OK, here’s the post where at least half of Mets fans decide they hate me, because they think I hate Josh Thole. Let’s get one thing straight: I like all catchers, therefore I like Josh Thole. Second, I like Josh Thole as a ballplayer because he works very hard, hustles, and gets as much out of his talent as he possibly can. Despite the fact I like Josh Thole, I can’t let that cloud my evaluation of him as a Major League catcher. That said, in 2011 Josh Thole did not make me believe that he is, or could become, a starting catcher on a championship club. After drastically improving his defensive skills from 2009 to 2010, maybe I expected too much from Thole in 2011. Specifically, I wanted to see significant progress in his ability to receive pitches with soft hands, in blocking balls in the dirt, taking charge as an on-field defensive leader, and in handling pitchers. But he either regressed or stayed the same in all of those areas. Most disturbing, there was buzz that some members of the pitching staff preferred not to have Thole catching — whether it was due to a personality conflict, difference of opinion in game-calling, or lack of confidence in his abilities. We are not privy to those behind-closed-doors issues, but the fact they leaked out is not a positive sign. On the bright side, Thole’s throwing technique to second base on attempted steals improved — thanks to improved footwork. His throws to second are now very accurate and he gets rid of the ball much more quickly than a year ago. However, his arm strength is below average and is unlikely to get stronger, so he absolutely must have perfect technique and the benefit of the pitcher preventing a good jump. Offensively, Josh Thole was somewhat disappointing, especially for the most optimistic Mets fans who envisioned a .300-hitting, .400 OBP on-base machine. Though he had a good spring training — flashing a bit of homerun power — he started the season poorly, hitting only .226 in the first two months. However, he had a spectacular June, hitting .327 with a .450 OBP and .899 OPS. Unfortunately, Thole couldn’t keep up that pace, though he did have a strong August. His final stat line looks good on the back of a baseball card: .268 AVG, .345 OBP, .690 OPS, 3 HR, 40 RBI in 114 games. That’s not bad for a catcher who also brings something significant while wearing the tools of ignorance, but unfortunately, Thole doesn’t — he’s only adequate at best. For me, Josh Thole either has to contribute a bit more offensively, or drastically improve at least one area of his catching, in order to be more than a back-up catcher. Where his skills stand right now, I wouldn’t consider him even in a platoon role — mainly because as a lefthanded hitter, he’d be handling the bulk of the duty. 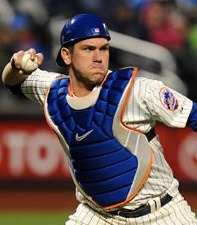 Barring injury, Josh Thole is almost certainly going to catch more often than any other Met in 2012. There are few everyday catchers available as free agents and fewer available in a trade the Mets would make. It could be a good thing; in a perfect world, Thole will get better and better the more he plays. But I’m concerned that he’s already taken his athleticism as far as possible with the old school receiving techniques that the Mets organization taught him; he might improve using different mechanics, but it’s highly unlikely he’ll have the opportunity to learn them. Further, Thole may not have the typical, strong personality of a backstop. While he works hard, plays hard, can handle the physicality of the position, and isn’t afraid to get dirty, his body language and actions display him more as a “follower” rather than a leader, and he seems to lack confidence; in fact, he’s borderline meek. Catchers usually have a more “type A” personality — one who takes charge and commands respect. That’s generally not something that can be learned — you either have it, or you don’t. Back Mets Hot on Dotel? Next How Long is Mets Rebuilding Plan? Good Morning, Met Fans…..I’ve had a bit of a guilty conscience of late. I just wanted to stop by, to claim responsibility for Josh Thole’s “power” in Port St. Lucie. Sorry to have had any of you gullible fans thinking he’d hit a few HR’s this past year. Happy Holidays, and see you in February! By the time Thole becomes a decent player, if that ever happens he will be either a free agent or arbitration 2 or 3 and the Met front office will say he’s too expensive. We are you see the new Pittsburgh Pirates. Tip of the hat Norm.. That was a great post. You guys are dead to me now. Point is Thole is better than average with the bat compared to his peers. I suspect he will improve offensively as last year was essentially his sophomore year and his struggles with the glove that I suspect will level off. Color me optimistic that Thole will have a better year with the bat. He is just entering his “prime years” too. “better than average” offensively is not enough to make up for Thole’s inadequacy behind the plate. The ability to play strong defense, handle a pitching staff, and be an on-field leader is first and foremost for a catcher; offensive contribution is secondary. Thole is worse behind the plate overall than Mike Piazza, and the only reason Piazza stayed back there was because he was other-worldly with his offense and he managed to earn a modicum of respect from his pitchers. Shortstop, catcher, and centerfield are the three positions where you can’t just “stick a bat and hope for the best” (some people would add 2B to that group). In my mind, Thole has to improve at least one aspect of his defense dramatically AND provide a .280+ AVG / .380+ OBP / .750 OPS to be considered an everyday catcher. Now, I understand there is a dearth of solid catching in MLB these days — and as a result, Thole appears to be a pretty decent option. But if you look at postseason clubs, they all have either a regular catcher or catching platoon that is significantly better overall than Thole — and IMHO Thole won’t ever reach that level. I don’t disagree that he should do better offensively to justify his defense, or that he need to upgrade his defense, but my point is there there does not appear to be a significant upgrade anywhere. I think if the backup is a solid defensive catcher it will help Thole. Paulino does not seem to be the best mentor. Pairing Thole with a veteran defensive whiz would be ideal for 2012. For me the Mets organization was a disappointment for not doing a better job of providing Thole with mechanics / technique that would make the most of his athletic ability. He’s hit a ceiling defensively as a result. Nice post. Not only did catching R.A. Dickey inflate his PB numbers, but I think it might have affected his mechanics when catching conventional pitchers as well. I still think he can be a solid defensive player this year. As for his offense, as long as he doesn’t swing for the fences, he should improve at the plate. What does Thole offer now? Fantastic contact rate, decent eye, almost no power, below-average throwing, poor pitch blocking and receiving, middling leadership. If he were 21, I’d be quite excited about his future, assuming he’d improve! If he were 28, I’d be looking for an upgrade, figuring he won’t improve. As is, he’s 24. So I dunno. Given our rebuilding phase, I’m happy to play him in case he improves. If he doesn’t, it hasn’t cost us much, and we can replace him as we approach contention. The Mets don’t have much of a choice – Thole is the guy back there for 2012, and we’ll see what happens. As for his personality, his meek response to the 9/11 hat incident spoke volumes. I dunno. If giving the finger to your employer and industry is the test of leadership, I doubt many players would pass. Thole = ugliest swing in baseball. I think it’s a little early for that; I’d wait at least until after the winter meetings next week. I’m sure there are people who think Dan Murphy would be at 2B, Jordany Valdespin could crack one of the middle infield spots, and/or Kirk Nieuwenhuis would be in CF — and they may be right. But as of this moment, the above lineup is what I see as most probable (and I’m assuming Ike Davis is healthy). Note, that doesn’t mean it’s the lineup that I would recommend. With Reyes gone, the Mets need some sort of offense. With that said Murphy has to be the starting 2B and will bat 2nd IMO. Thole will bat 7th. Im also think Duda and Bay may be flipped solely based on my lack of confidence in Bay even with the shortened fences. I agree, Joe. Josh’s bat was a major disappointment to me last year, especially after he hit 3 HR in spring training. He’s got decent size, and as we have occasionally seen, pretty good power. He can really turn on an inside pitch and blast it. So to see him go up to the plate like Luis Castillo, just looking to poke the ball over the shortstop’s head infuriates me. I projected .275 12 HR 60-65 RBI for him last year. Somebody needs to get him out of that ridiculous crouch (except maybe with two strikes) and to drive that ball like he is more than capable of!